Thanks to the inherent connectivity of the QNX Aviage Multimedia Suite, a single platform can support media sharing among multiple users, immediate and unique identification of media devices and streams (including portable media players), auto synchronization to databases, and multiple playback and record paths. The QNX Aviage Multimedia Suite offers a full set of tools for building high-value, connected digital infotainment platforms. Supported by the real-time reliability and performance of the QNX Neutrino RTOS, the suite lets developement teams bring to market the infotainment features and capabilities customers demand — quickly, for the lowest possible cost, and with minimal risk. Functionality can be distributed among different suite components and external devices when appropriate. For example, a single database can be used to store metadata throughout multiple nodes in the vehicle. Similarly, hardware can be shared; a multi-zone system can share a single Apple Authentication IC to save on BOM costs. Because the QNX Aviage Multimedia Suite is inherently distributed, users can share media across multiple nodes—rear-seat people can play media plugged into the front seat and vice versa. The QNX Aviage Multimedia Suite's modular architecture facilitates the scaling of applications — down to meet constraints imposed by hardware limitations as well as up to take advantage of more powerful boards and meet customer demands for richer feature offerings. QNX software has powered mission critical applications for 30 years and, since its first release in 2007, the QNX Aviage Multimedia Suite has been successfully deployed in a host of major automobile production models, as well as in the new QNX CAR (connected automobile reference) program. In addition, to further lower the risks associated with developing and bringing multimedia projects to customers, QNX Professional Services can provide a dedicated group of engineers whose unique mix of experience, skills and contacts ensures success. The QNX Aviage Multimedia Suite follows POSIX and SQL standards, ensuring that programmers and systems integrators are immediately comfortable with the software and the development model. High-level APIs and text-based configuration files facilitate development and tuning of multimedia applications. The QNX Multimedia Suite has been designed, built and deployed with the same commitment to performance and reliability as the time-tested QNX microkernel operating systems. The QNX Aviage Multimedia Suite is comprised of a core package plus a full range of technology, device, and codec specific packages, all managed through the same API. If a technology, device or codec you need is not listed, please contact us for more information. → device and mediastore insertion and removal — HDD, CD, DVD, USB key with media, etc. The QNX Aviage Multimedia Suite has been designed, built and deployed with the same commitment to performance and reliability as the time-tested QNX microkernel OS. Market-focused hardware support — support for reference boards (CPU and DSP combinations) required by consumer and automotive OEMs. Component stability — an easy-to-use API to stable, proven components. Adapt multimedia implementations quickly to meet ever-changing market requirements without concern for the integrity or stability of the underlying software. Risk-free upgrades — replace or upgrade underlying components, such as decoders, without any change to HMIs. Add new media storage devices, new streaming content or new DRM techniques without upsetting original device behavior. Easy configuration — adapt system behavior to meet diverse and changing user and implementation requirements by simple edits to text configuration files. Embedded focus — control ROM and RAM requirements by removing unneeded components, or by restricting the requirements needed by specified components. Contain a component failure and restart the component without a system restart. Fast boot and instant power off — access media content with no intrinsic delay after a cold boot. Power off a device at any time, even while writing to storage media. Consistent HMI response times — present the user with quick and consistent HMI response times. A user pressing a button or a touch screen gets the same system response, regardless of the current activity — ripping a CD, recording XM radio, or simply playing music. Data integrity — ensure data integrity with reliable filesystems for embedded hard drives and large storage media. → QNX Software Development Platform running as a self-hosted QNX Neutrino system. The MME is designed to simplify and speed development of end-user applications that require device and filesystem access, content synchronization, playback control, and audio and graphics delivery. It handles multiple clients, sessions and streams, and abstracts hardware and protocol dependencies from other functional areas. Together the MME and the QDB make up the interface to HMI client applications, providing them with an API to control, browse, copy or rip, and play media, as well as the ability to monitor and manage multimedia processing. HMIs do not normally need to interface with the QNX Multimedia Suite's lower-level. 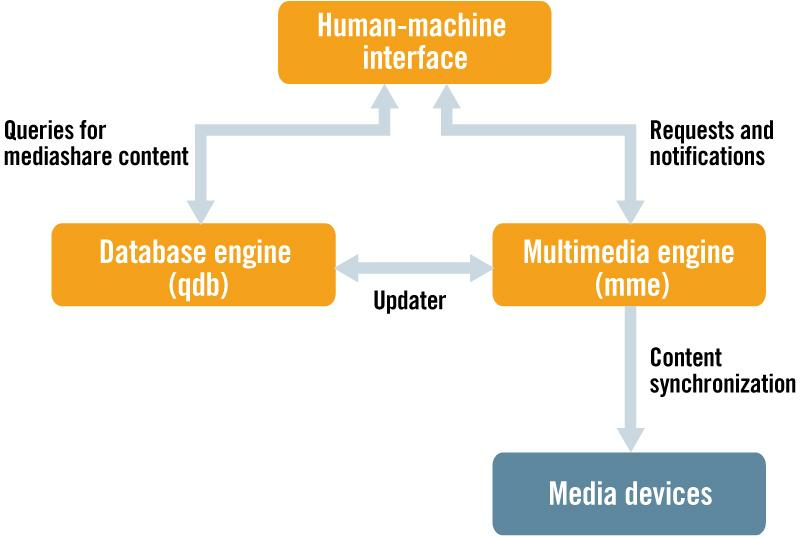 The primary interface (the MME) controls the low-level components that directly access and process media data. The QNX Multimedia Suite API provides access to a lower level component, which offers low-level transport, control and rendering of media data. The HMI passes instructions through the primary interface (the MME), which then specifies the task, the media input source, the output device, the class of graph it requires, and a name for the graph instance it will use. The media transport, control and rendering component uses this information to create a graph instance, which processes the media. To process a multimedia stream, the QNX Multimedia Suite's media transport, control and rendering component selects from this framework only the filters it needs to get the multimedia data, process it, and send it to a target device. The multimedia framework uses the QNX Addon Interfaces library to define its standard interfaces, so that new components, such as codecs written by QNX or by third parties, are easily incorporated as they become available. In many cases, these additions can be made without recompiling the framework or the applications that use it. If a technology, device or codec you need is not listed, please contact us immediately for more information.